Have you ever tried to create a large map from a number of separate images? Some people take a number of screenshots of a zoomed in area (say Google maps), and then use a some sort of photo editing software to stitch each image together to make a single large image. This will work of course, but why not use the free Microsoft Image Composite Editor? What is Image Composite Editor? Microsoft Image Composite Editor is an advanced panoramic image stitcher. Given a set of overlapping photographs of a scene shot from a single camera location, the application creates a high-resolution panorama that seamlessly combines the original images. The stitched panorama can be shared with friends and viewed in 3D by uploading it to the Photosynth web site. 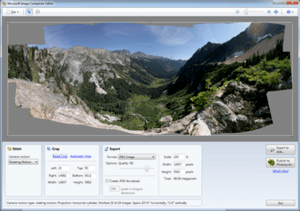 Or the panorama can be saved in a wide variety of image formats, from common formats like JPEG and TIFF to the multiresolution tiled format used by Silverlight’s Deep Zoom and by the HD View andHD View SL panorama viewers.